12/26 Checked in with Port Captain, Migracion. 12/28 To Puntarenas by bus to check in with Aduana. They moved to Caldera. 12/29 By bus to check out marina at Jaco. It is in Bahia Herradura. No buses, no facilities, a $4 taxi ride from Jaco. 1/14 Got rudder post repaired at Taller Sammy Manley in Puntarenas. Installed coffer's dam yesterday, and rudder bearing and rudder today. 1/2 mile sail to check rudder. It works! 2/1/01 Michael and Kathleen anchored "III Sheets to the Wind" next to me and came to visit. 2/4 Luke and Fenton on "Jackfish" anchored next to me. 2/13 Visited Bushie, Aru, Micus, and Riun on "Yetagan" from South Africa. Totally beautiful people. 2/23 Demonstration sail with Jerry Purcell. Beautiful sail. No sale. 4 nm. 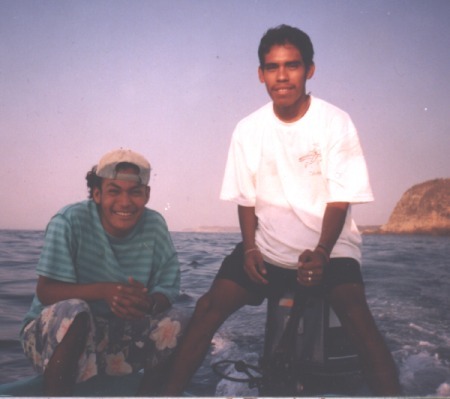 Sailed 54 miles, went on motor to clear Cabo Blanco. Didn't sleep all night. Beam reach Punta Judas to Cabo Blanco, 20 - 25 knots Steep seas in wind against incoming tide. "GIFT" rode it easily with just a reefed jib. Balanced. Motored to Bahia Carrillo so I can sleep. 3/8 Arrived Bahia Carillo at 1100. Papagallos 20 - 25 knots. I will wait out this wind pattern. 3/9 Left Bahia Carrillo at NOON:30 Motored to Punta Guiones under westerlies almost on the nose. 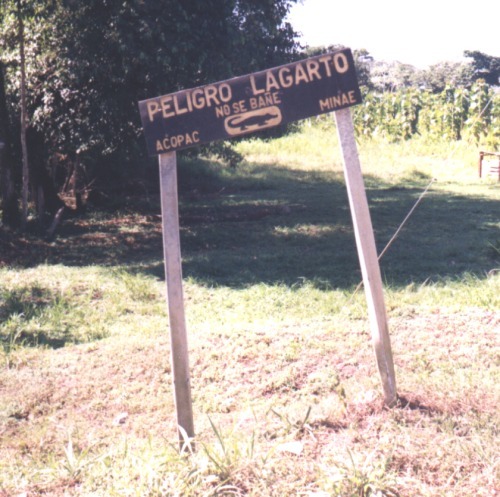 Winds shifted at Punta Guiones, went on a port tack on a course of 270 degrees to 290 degrees. "GIFT" raced the sun, Saturn and Jupiter to the western horizon. They all beat me. 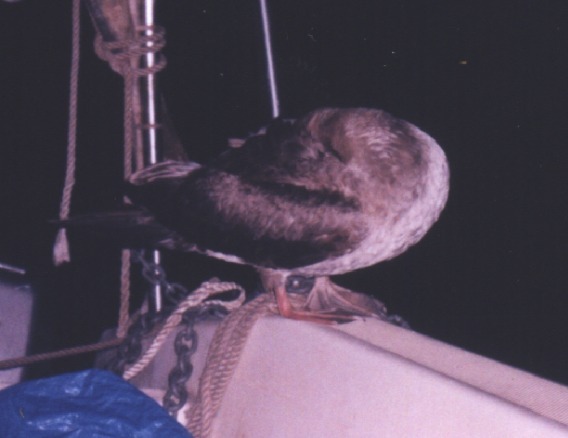 Now "GIFT" is on balanced sails on a moonlit sea. A favorable current makes the course made good close to 305 degrees. The current is 2 knots. 3/10 Sailed all night, becalmed at times. Motored only to get around shoals. 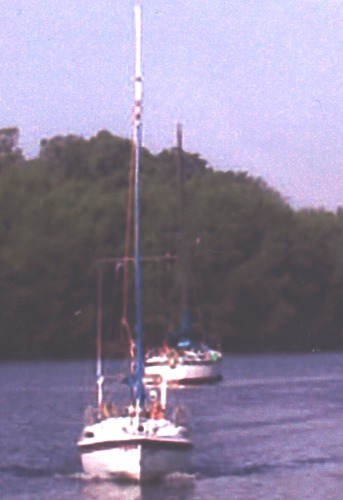 Anchored under sail at NOON o'clock in Flamingo Bay. 53 nm. 3/11 0800 Met with Jerry Purcell and Jim McKee. Costa Rica requires that seller obtain a certified copy of the title at the Costa Rican Consulate in Los Angeles. Left at 0900. Arrived Playa del Cocos at 1130. Sailed most of the way. Saw a whale, probably a Sperm Whale, off Punta Gorda. 13 nm. 3/15 Upped anchor at 0530. Left Playa del Coco on a mousy south wind. Changed sails. The fly of the working jib needs sewing. Becalmed for a while, but then WSW winds of 5 - 6 knots set in. Tracked 312 degrees. NOON: GPS 10 degrees 43.267'N 85 degrees 47.052'W Sextant 10 degrees 05..2'N 86 degrees 27.0'W I missed LAN (local apparent noon) Weather reports claim benign winds on the Caribbean side. Near Bat Islands motored for 1/2 hr, then N winds set in. It was blasting near the islands, but when clear of Little Bat Island wind was N 8 - 10 knots. "GIFT" balanced to 312 degrees. 1710 down came the Costa Rican flag, up went the Nicaraguan flag. Late evening 15 - 18 knot easterlies set in, mellowing as the night wore on. 3/16 Easterlies still with me. Weather reports look benign for the next few days. Covered 60 miles in 24 hours. Good sleep last night. 0530 3/15 - NOON 3/16 74.4 nm. SW wind 8 - 10 knots in afternoon, becalmed 2 hours in evening. Then E winds set in. 3/17 St. Pat's Day E winds increased to 15 - 18 knots for a few hours. NOON GPS 12 degrees 06.248'N 87 degrees 04.019'W Sextant 12 degrees 24'N 86 degrees 50' W. NOON - NOON 48.7 nm. Afternoon winds were NE and light. Spent most of the night bobbing in circles. At 0250 a little storm came through with gusts to 20 knots and light rain, After the storm it was NE winds 15 - 18 knots until about 0800 3/18. 3/18 Bouncy seas, wind shrieking in the rigging. Mellowed out by 1000. Began motoring at 1130 ti arrive at Barillas Marina in daylight hours and to beat a weater window that may close out Monday evening. 1115 N12 degrees 32.048' W 87 degrees 37.096' NOON 3/17 - 1115 3/18 41 nm. Spent the Gulf of Fonseca sailing off shore and back in mousy NW winds. 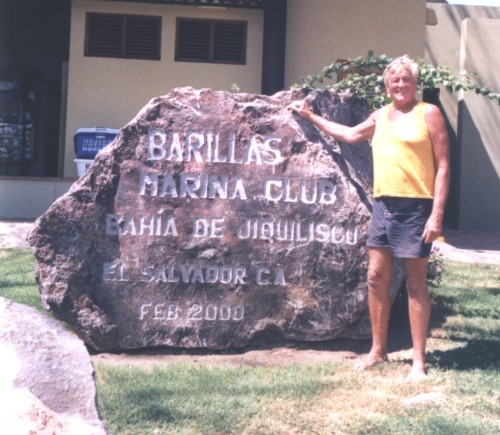 4/8/01 Left Barillas Marina 0730 in convoy with three other boats piloted by a panga from Barillas Marina. Beyond the shoals at 0945. SE wind 6 - 8 knots, increased to 10 - 12 knots for a while. Night time winds were 8 - 10 knots on the nose. 4/9 Becalmed in the morning, motored 3 hrs. NOON 13 degrees 02.046'N 89 degrees 21.003'W 0730 4/8 - NOON 4/9 64.9 nm. E wind 6 - 8 knots 1000 to noon. Wind clocked around to WNW at sundown. 4/10 Wind WNW all night. Clocked to N at 0230. Four guys in a panga stopped to talk. Winds are clocking again. N in the morning, E in the midday, W in the late afternoon and WNW in the evening and all night. NOON 13 degrees 03.451'N 89 degrees 53.132'W 34 nm. 1600 hrs. Up went the Guatemala flag. Three booby birds are perched on my bow pulpit. The booby birds figure I am harmless. They let me move about the boat without becoming alarmed. 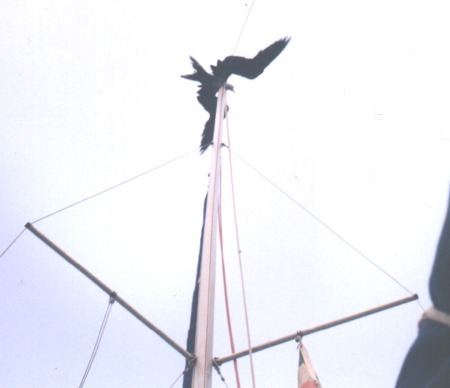 I sat next to one to adjust the tiller and touched its tailfeathers before it moved. 4/11 Mousy winds on the nose. Motored some. NOON N 13 dsegrees 12.078' 90 degrees 30.4323' W 37 nm. Now my booby crew is up to four. 4/12 Sailed N all night to close in on the shore. Abreast Puerto Quetzal at 1000. NOON to NOON 53 nm. 4/13 Winds on the nose yesterday. Motored a lot. NOON 14 degrees 01.560'N 91 degrees 40.214' W 45 nm. It is Friday! I don't want to arrive in Puerto Madero on the weekend. Tried working off shore to miss shoal water. Finally the wind died. Couldn't sail. Didn't want to motor. The water was only 53 feet deep so I anchored! It was bouncy but I had a good night's sleep. 4/14 Ghosted out of shoals on an off shore wind. A travelling wind picked up in the afternoon. NOON N 13 degrees 56.540' W 91 degrees 57.062' W 26 nm. Motored some at night. 4/15 Ghosted on off shore breeze, motored some. Becalmed. NOON 14 degrees 21.484'N 92 degrees 15.684'W 32 nm. Noon up went the Mexican flag. Actually crossed the border at 1500. Orbited all night to avoid entering harbor on a weekend. 4/16 Motored into Madero. Anchored 0930 by the Port Captain's office. N 14 degrees 42.272' W 92 degrees 24.354' 24 nm. 4/20 Friendly travelling wind S - SW 8 - 10 knots. An easterly blew all night. 0645 4/19 - NOON 4/20 79.9 nm. Travelling wind swung to a nose wind. Anchored in 56' of water. N 15 degrees 45.554' W 93 degrees 34.223' Anchor line got wrapped around the keel. Made a night dive to free it. Phospheresence had the whole job lit up like a light show! 4/21 Motored for 5 hrs. Usual SW wind set in for the afternoon. All indications are for a good crossing of the Gulf of Tehuantepec. NOON 4/20 - NOON 4/21 38 nm. Good winds. 4/22 N wind 18 - 20 knots in the morning. NOON 4/21 - NOON 4/22 73.7 nm. Easy sailing in the afternoon. Planning to arrive in Huatulco in daylight hours 4/23. 4/23 Winds died. Becalmed all night. Motored 18 miles into Huatulco. NOON 4/22 - 0826 4/23 50 nm. 4/25 Two hour sail offshore with Mundo and Jose 3 nm. 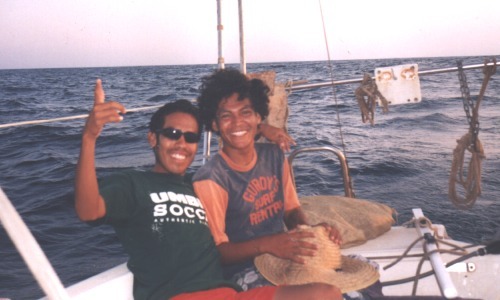 4/28 One hour with Mundo and Jose looking for wind. 2 nm. 5/6 Beautiful sail with Juan and Liz 3 nm. 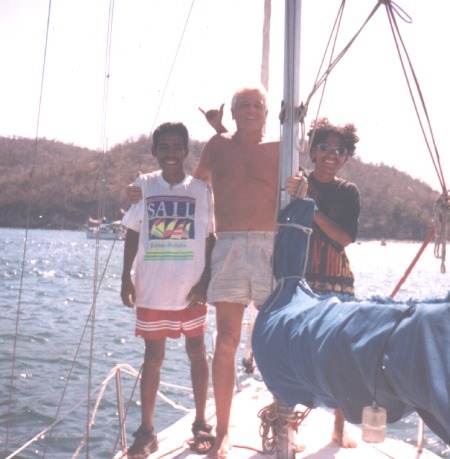 5/13 Beautiful sail with Enrique LaCollet and his wife. 3nm. 5/14 Made deal with Juan Ongay and two others to sell "WIND GIFT"